Fair Housing Act challenge: Supreme Court saves the law. The Supreme Court saved disparate impact claims under the Fair Housing Act on Thursday. 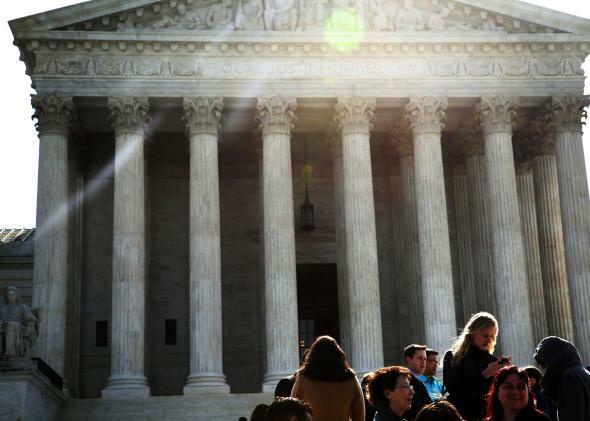 On Thursday the Supreme Court rejected a major challenge to the Fair Housing Act, affirming that the law forbids “disparate impact” discrimination—that is, discrimination that is race-neutral on the surface but racist in practice. This decision is rather surprising, since a majority of the justices seemed skeptical that the law barred such discrimination during oral arguments. The ruling was 5–4; Justice Anthony Kennedy wrote the majority opinion, joined by the more liberal justices, while the four conservatives dissented. Kennedy’s opinion is extremely persuasive and straightforward. He explains that the FHA, as initially written, seemed design to outlaw both “disparate treatment” (that is, intentional, explicit racism) as well as disparate impact. The FHA made it unlawful to “refuse to sell or rent … or otherwise make unavailable or deny, a dwelling to a person because of race.” (Emphasis mine.) This key phrase, Kennedy notes, clearly bars both racist intent and racist consequences. The lawsuit at hand illustrates this distinction quite well. Texas made low-income housing available primarily in low-income, predominantly black neighborhoods. The effect of this decision perpetuated segregation. Texas may not have enacted this policy explicitly to keep blacks segregated from whites. But under the disparate impact claim which the court just affirmed, minorities can still sue Texas for enacting a policy that furthers segregation. [S]ince the passage of the Fair Housing Act in 1968 and against the backdrop of disparate-impact liability in nearly every jurisdiction, many cities have become more diverse. The FHA must play an important part in avoiding the Kerner Commission’s grim prophecy that “[o]ur Nation is moving toward two societies, one black, one white—separate and unequal.” The Court acknowledges the Fair Housing Act’s continuing role in moving the Nation toward a more integrated society. Justices Clarence Thomas and Samuel Alito wrote blistering dissents. Alito accuses the majority of mangling the law out of its “desire to eliminate the ‘vestiges’ of ‘residential segregation by race,’ ” thereby “privileging purpose over text.” He argues that the FHA should only prohibit “disparate treatment” discrimination—basically, outright racism. Any discrimination more subtle, Alito suggests, can’t be litigated under the FHA.